My name is Beth and I’m a long-time survivor of a childhood benign brain tumor. I was diagnosed with a brainstem glioma in 1985 when I was eleven years old. I had two craniotomies and radiation treatment. I used to cry when I talked about anything having to do with my tumor, treatment, or side-effects. I went from a girl who did no-handed cartwheels and handsprings to waking up in the hospital bed post-surgery with everything looking upside-down and having double vision. I couldn’t walk, lost hearing, my eyes were crossed, etc. What was going to happen to my dream of being an Olympic Gymnast? Was I going to move down from my higher-level classes in school to lower ones? Was I still able to go to school events although I was recovering at home? The thought of missing the Valentine’s Dance felt like the end of the world. Well, more than thirty years later and I’m still here. I credit my parents for my being alive. They both had science backgrounds and were aware of how important it was to select the best neurosurgeon and treatment plan for me. Remember, it was a different time in 1985. There was no Internet, and MRIs were a novelty. We never knew anyone who had a brain tumor. My childhood dreams were de-railed by the tumor. I did graduate from high school and college, but graduate school was no longer in the picture. I wound up collecting disability (and resented it for many years). I have worked part-time when I have felt up to it. I have had so many side-effects, physical and emotional, from the surgery and radiation treatment, that relationships with friends and boyfriends have been affected. Right now, marriage and children seem beyond reach. In other words, my childhood benign brain tumor has affected every aspect of my adult life. I’ve never felt that I’ve ever fit in anywhere since my diagnosis. Even some of my friends & family need reminders that I’m limited with certain activities. It’s very difficult feeling like explanations are always needed. Fortunately, the Internet happened, and I no longer had an excuse for feeling isolated and angry. For the first time, I met another benign brain tumor survivor in 2007 and that is when I decided that it was essential for those recently diagnosed with a benign brain tumor, as well as for survivors, to have their own “space” to give and receive support, to share information and to communicate with each other, and to have a place where their experiences were not minimized. Even today, there is little understanding about how life-threatening and serious benign/non-malignant brain tumors can be. So in 2008, I founded It’s Just Benign. Here you can communicate with others who are dealing with similar experiences, ask advice about specific types of problems you are encountering, seek information about neurosurgeons and treatment options, and get to know other benign brain tumor patients and survivors who live near you and around the world. Getting diagnosed with a benign brain tumor and living with the consequences of treatment is scary. 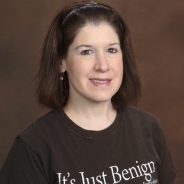 It’s Just Benign provides the support you may need when your life or the life of a loved one is affected by the diagnosis of a benign brain tumor.